Research in Charles Sanders Peirce’s thought has grown rapidly both within and outside the arena of philosophy on the global level. Peirce’s pioneering contributions to philosophy, pragmatism, logic, the theory of signs, philosophy of science and to numerous other fields are currently being explored not only in philosophy but also in other sciences and in art studies. 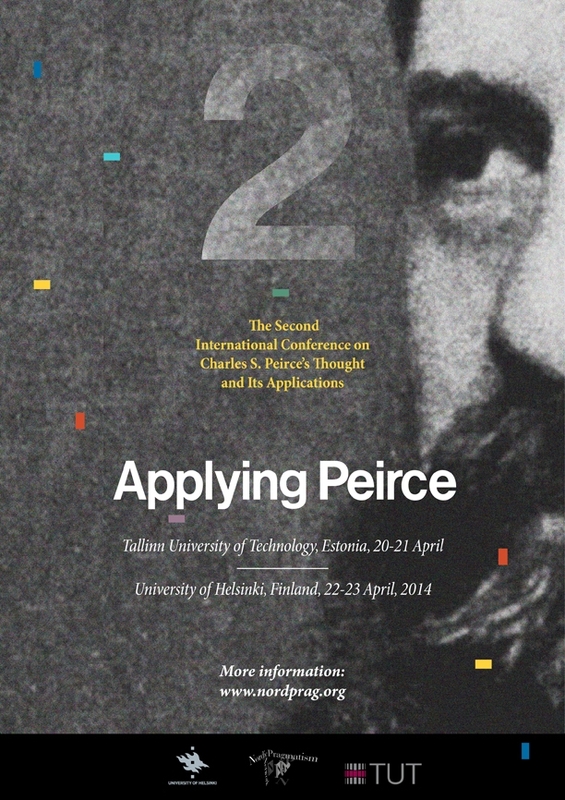 The second installment of the Applying Peirce conference, first held in Helsinki in June 2007, brings together Peirce scholars and researchers to explore and discuss Peirce’s thought and applications in diverse fields. The year 2014 marks the centenary of Peirce’s death in Milford, Pennsylvania, in 19 April 1914. The meeting takes place in the twin cities of Helsinki and Tallinn, connected by a two-hour ferry ride. The programme consists of workshops and a small selection of contributed papers. The conference takes place at Tallinn University of Technology, Estonia (21 April) and the University of Helsinki, Finland (22-23 April). The program begins on 21 April 2014 at 10 am in Tallinn. The conference is organized at Tallinn University of Technology (TUT), address: Akadeemia street 3; building no. X, 3rd floor, lecture room X-311. To get to Tallinn University of Technology from the city center, take trolley no 3 opposite Kaubamaja (Tallinn Department Store) or express bus no 11 (Kunstiakadeemia stop) to Keemia stop. We will organise an informal gathering in the city center on 21 morning to go together to the University. In Helsinki, the conference takes place at the Topelia building of the University of Helsinki, address Unionionkatu 38, class C120. On 22 April, the programme in Helsinki begins at 11:30 am. The location is a 5 minute walk away from the conference hotel. All participants arriving from Tallinn on the morning of 22 April are recommended to take the Viking Line day cruise departing from Tallinn at 8:00 and arriving in Helsinki at 10:40 am. Note that you should be boarding at least half an hour before the departure of the ferry. The conference has been sponsored by the Federation of Finnish Learned Societies and the Ragnar Nurkse School of Innovation and Governance. Please send an abstract of 300-500 words to info@nordprag.org by 1 February 2014 (in pdf, rtf or doc format). Notifications of acceptance will be sent by 8 February 2014. A time slot of about 30-35 minutes (including discussion) will be allotted for each paper. It has sometimes been claimed that, unlike many other classical philosophers, Charles Peirce had few or even no intellectual heirs at all. This event intends to establish the extent of relationships between Peirce and his pupils, students, collaborators, successors and inheritors – and to what extent these notions themselves also call for historical and philosophical clarification when it comes to the legacy of a great thinker. Although having held no permanent academic position, Peirce led the Metaphysical Club and instructed a famous circle of logic and philosophy students at Johns Hopkins University. Moreover, he lectured often, developed correspondence courses, collaborated with a number of scientists, and contributed with his student Joseph Jastrow to what became the field of experimental psychology. His correspondence reveals that many were eager to learn from him, and he designed courses with attention to logic teaching and pedagogy. Thanks to the efforts of Ladd-Franklin and many others, a Peircean school of logic may have been in the making already in his lifetime. These and many other issues invite a closer investigation of Peirce’s legacy as viewed through his students. Peirce’s students at the Johns Hopkins University: John Dewey, Allan Marquand, Christine Ladd-Franklin, Oscar Howard Mitchell, Benjamin Ives Gilman, Joseph Jastrow, Ellery W. Davies, Thorstein Veblen, Josiah Royce, Henry Taber. How do Peirce’s teachings show up in their own careers? Submissions (max. one page abstract) should be sent to peirce.workshop@gmail.com by 28 February 2014. Notifications by 8 March 2014. Organisers: Jean-Marie Chevalier (Collège de France) & Amirouche Moktefi (Tallinn University of Technology). Was Benjamin Ives Gilman a Peircean till His Last Days?